Fusing glass noodles are thin flat strips of art glass used to create fused glass designs and patterns. Usually about 17" (43cm) in length, they are flattened to about 1.35mm thick by 4.5mm (3/16") wide, and are sold in 5 oz tubes (140 gm). Noodles are rolled and stretched whilst being made and have the appearance of fettuccine pasta. Uroboros Glass is the main maker of System 96 and COE 90 noodles. Always ensure you purchase the correct COE to match the glass you are using. 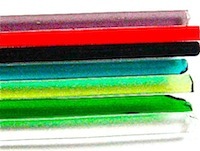 Fusing glass noodles can be purchased as tubes of separate or mixed colors. Noodles are made from opal, reactive or transparent glass. A large choice of colors is available. A range of clear and black rainbow dichroic noodles may be purchased for use in glass fusing designs. Dichroic noodles make a striking design feature when used in a fused glass art item. There is also a range of clear and black wavy firestick noodles that will produce some striking effects when fused in a glass kiln. Noodles can be used in strip construction, this removes the need to measure and cut individual glass strips. Many designs that require art glass strips can use noodles. Because they are flat they will not roll around like stringers and are easy to use as an addition or design element in a fused glass design. Glass noodles provide nice even stripes of color when used in a glass art design that is fused in a glass fusing kiln. Delicate weave patterns can be constructed with fused glass noodles, it is very easy to mix contrasting or dichroic colors together in a woven design. After fusing the glass can be slumped in a glass fusing mold to produce a nicely fused and slumped fused art glass design. Depending on the number of glass layers, normal glass fusing and slumping schedules are used with glass noodles. Glass noodles are a very handy addition to your art glass supplies due to the range of colors and flexibility they can bring to fused glass designs. They are very good to use as small filler pieces in many fusing glass patterns.